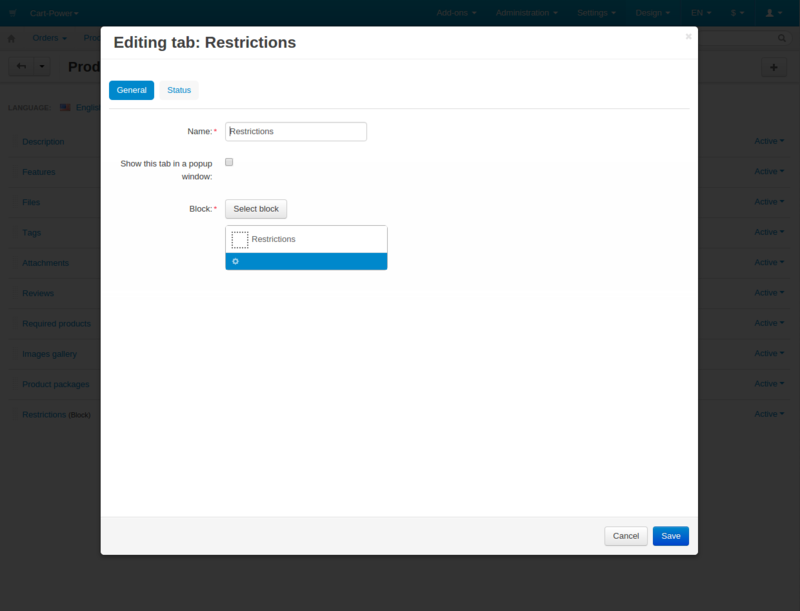 We are glad to inform you about the release of our new Shipping restrictions add-on! 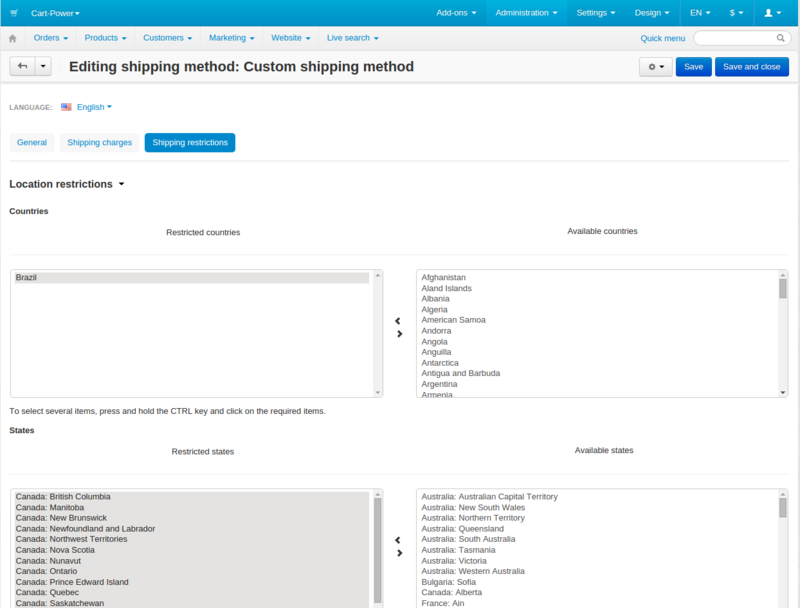 This add-on allows setting minimum and maximum order subtotal for each of the shipping methods in the store on the both Administration > Shipping & taxes > Shipping methods and Administration > Shipping & taxes > Shipping methods > [shipping_method_name] pages. 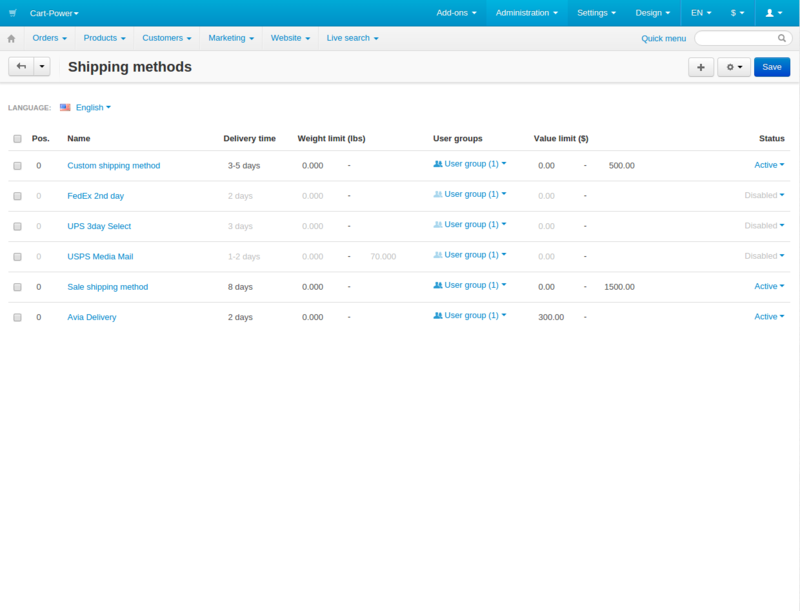 We are glad to introduce you the updated Shipping Restrictions add-on. Its new name is Shipping and Payments Restrictions. We have significantly enhanced the functionality of the add-on. First of all, now you can disable the shipping method for the specific country or region (state). Also, you can set the same restrictions for the payments basing on the customer's address. Moreover, you can forbid the shipping methods and payments for the category and the product. Please, see more details on the official add-on page. Nice Addon! Any plans of adding a restriction for payment method depending on the products vendor? Thank you for your kind words. Thank you for sharing the idea. We will add it in on of the future add-on releases. I have just purchased your Shipping Restriction addon and installed. However, none of the functionality appears in my store after entering a valid license and activating the addon. I have also tried clearing my cache. There doesn't seem to be any code having to do with restrictions. Even a simple string search for button labels 'Shipping restrictions' and 'Shipping payment restrictions' does not appear in the downloaded files. When I log into my account at https://store.cart-power.com, the download links don't appear to have been updated in at least a year. It looks like a great addon, and I really need the functionality it supplies. Please let me know how I can get the correct code for the addon. I have also filled out your store's Contact Us form regarding this issue and will also contact you at https://hd.cart-power.com. EDIT: Tatiana from Cart Power got back with me right away with the correct addon code. Works as advertised! Great addon, great support! Edited by nevans54, 25 August 2016 - 10:52 PM. Thank you for your kind words. We apologize for the situation with a problematical initial download. Hope you enjoy the add-on. Do not hesitate to ask any questions. Is this addon compatible with cscartrocks onestepcheckout & google address autocomplete? i.e. 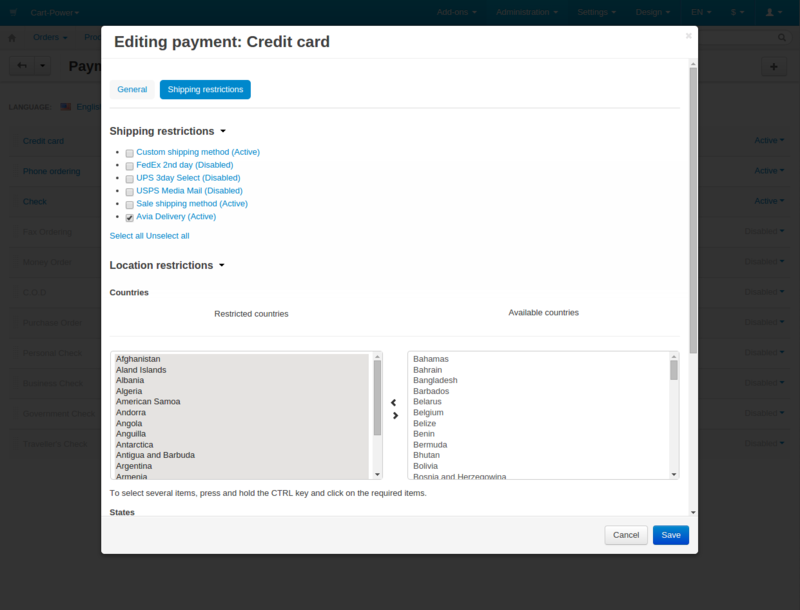 if the customer changes his country, or payment method or shipping method or removes a product in the checkout then will the restrictions update? What happens if the customer has a product in the cart and then sets their country to a restricted country? Does the customer see a notification why they cant order a restricted product? We need to restrict the number of items per customer. Lets say there is a maximum of 10 items. However, there are variants with different amounts per pack. We have packs of 10, 5, 3. So customers should be allowed to order 1 pack of 10. Or 2 packs of 5. Or 3 packs of 3. Or 1 pack of 5 and one of 3. We would like to apply this on category level so that it doesn't matter if the customer buys 10 items from brand A, or 10 items from different brands. Unfortunately, we did not check our add-on with the specified add-ons from CS-Cart Rocks, but we tested it with our own One step Checkout add-on (it also has address autocomplete function) and it works fine. Yes, in these cases the list of available shipping/payments will be updated. As for described feature request, it can be done only as a custom modification. Please, contact us by e-mail: sales@cart-power.com to discuss it in more details. We are currently using Alt-Team's shipping restrictions which they developed for us. Is there a way to import the shipping restrictions into your addon or do we need to set everything up again? This message is very vague and will only confuse and anger the customer. Is it possible to change the notification depending upon the restriction that was triggered? Also: will the products without restrictions still be in the cart? The notification you quote indicates that the whole order is lost instead of removing only the restricted product. 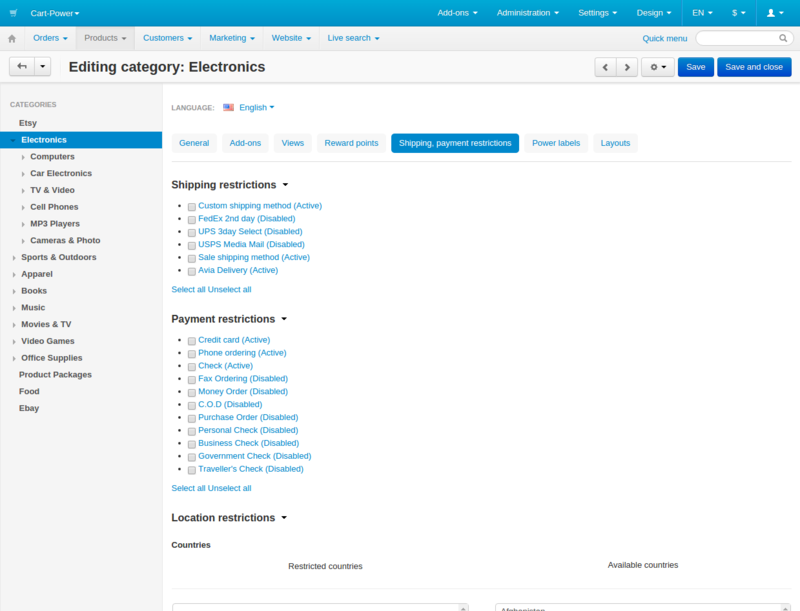 When ordering multiple products, with one restricted product the checkout has many problems. 1. All products were removed instead of just the restricted product. The customer cannot complete the order. 2. The checkout lists '2 items' instead of one. 3. The checkout still lists the total amount including the restricted products. 4. Its possible to click 'Continue' while there are no products in the cart. Will clicking continue allow the order with restricted products to be completed? 5. I used 'Denmark' as the customer country on your demo. There are shipping methods available for this country. But the notification states that there are no shipping methods available for the location. Hence the customer cannot order. @ Cart-Power. It is important to have an alternate message here that pertains more closely to the reason for for Payment or Shipping restrictions. The standard cscart still needs to remain to deal with standard addressing problems like the customer entering the postcode incorrectly (we get that alot). Ifthe customer enconters cart issues , such as some/all items being removed . then they need a message alerting them as to the reason. Unfortunately, we don't know the structure of the Alt-Team's add-on, so the add-ons are unlikely compatible and you need to set up the restrictions manually. We will add the unique notification for the situations when order can't be placed due to shipping and payment restrictions. The general idea of the add-on is not to remove products from the cart if there are shipping / payments restrictions in the store but to restrict placing orders for some products to the specific locations. So, if the product is restricted to the country, the order can't be placed, but the product remains in the cart. As I can see from the screenshot you try to place an order for 100g Fit that is restricted To Denmark. According to the add-on functionality, the order can't be placed. We will add this functionality in one of the future releases of the add-on. So if a customer orders 100 products and 1 is restricted, we loose the sale of 99 products? I hope you understand that this makes your addon problematic. We don't want to loose valid sales. 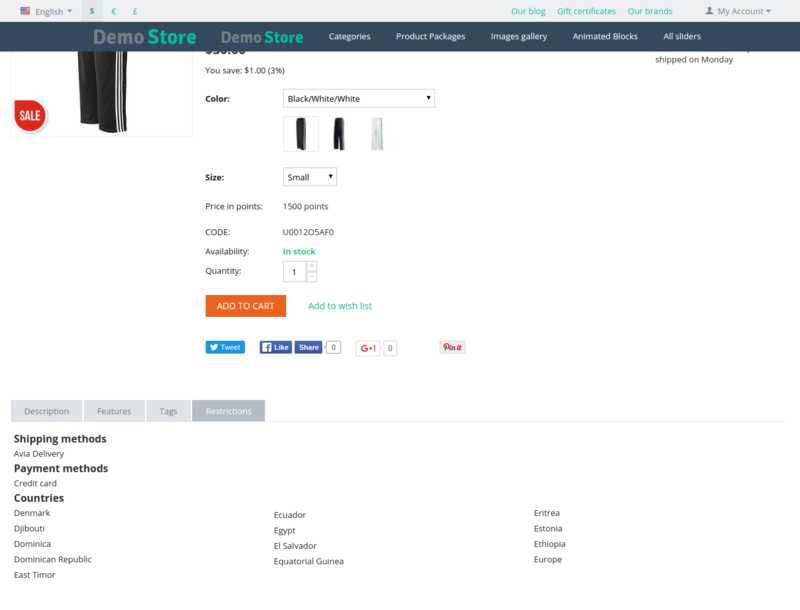 The order does not show any products. The functionality is too confusing for the customer. 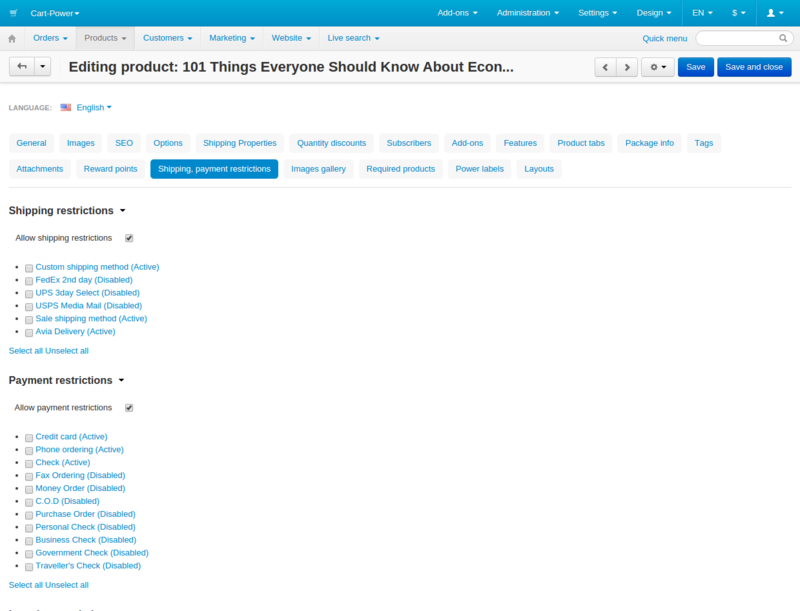 The dead end checkout page without products listed makes little sense. Please consider to make it easier for the customer to understand. It seems like the page is broken. We need the customer to order products that are not restricted. Not scare the customer away. Sorry for delay in answering. As I understand, you mean the block with products on the checkout page. It is turned off in our demo. We appreciate your opinion and do our best to improve the restrictions notification system for customers in the storefront. Can you turn this on please? Yes, please. The order information blocks are enabled in our demo now.